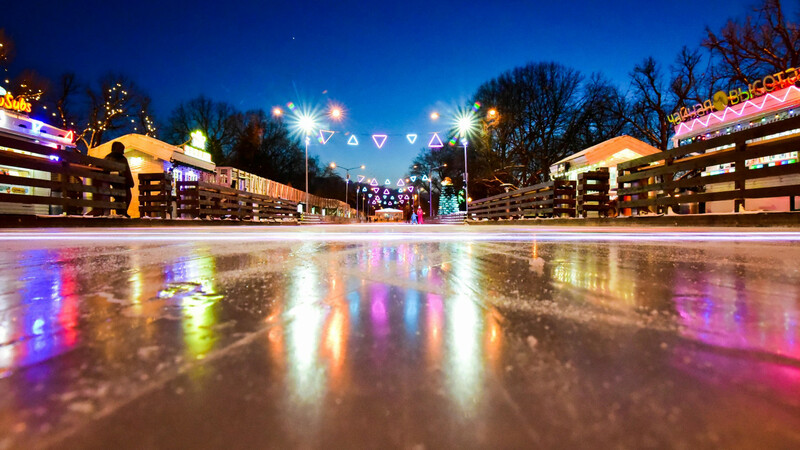 Gorky Park is opening its brand new “stereo” skating rink to the public on Thurs. at 7 p.m. with a big party on ice. Visitors can check out the new skating tracks, watch a theatrical performance choreographed by a star, and dance to music of the English electronic duo Maribou State and Holly Walker. On Monday the park’s director, Marina Lyulchuk, introduced the new rink — on skates. 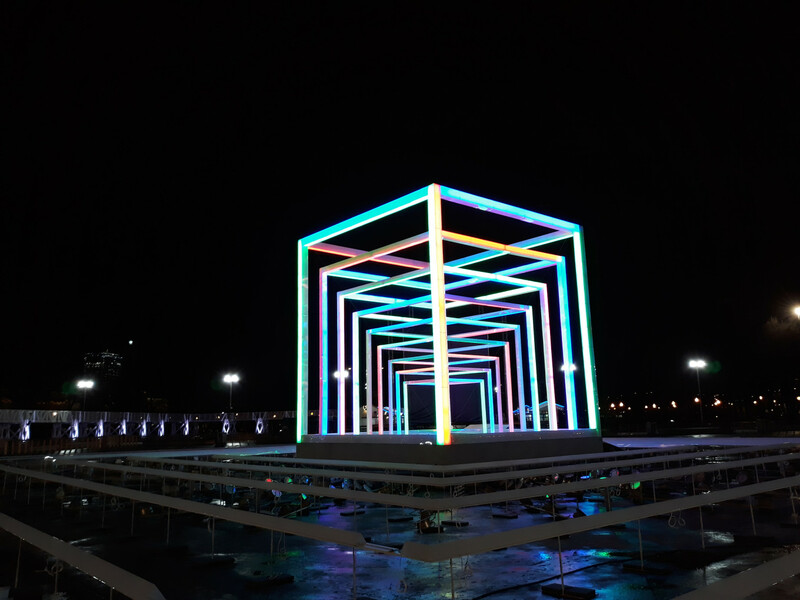 The innovation of the season is a cubic construction the park calls its “stereo heart.” “The cube consists of nine smaller ones, like a Russian doll,” Lyulchuk said. “It has 44 edges lit up by 15 kilometers of LED strip lights. It will work day and night, and the level of brightness will change along with the tempo of the music played from the stage,” she said. The rink has optical illusions and light installations to create a sensation of another reality filled with image and sound. But it’s not the only novelty this season. A second food court with a DJ will be situated on the grounds of the summer dance floor. And another change for the better is easier access. “The skating rink is really popular and people usually have to stand long lines to get here. 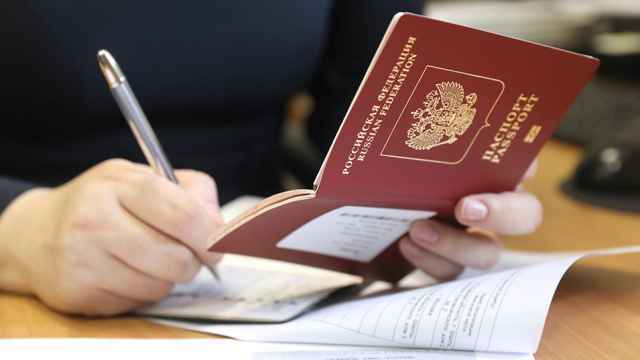 This year we have launched a new system – visitors can buy a ticket online, download it to their gadget, hold it against a scanner on the turnstile to get in,” Lyulchuk said. There will also be two ticket terminals in the central part of the park as well as by the entrance to the ice. This year the total size of the skating areas is larger than previous years and almost 20,000 square meters. It can comfortably accommodate about 6,000 skaters at one time in the central rink and outer-lying tracks. Kids under the age of 14 will have their own zone, and there will be a separate rink for hockey. The kick-off for the rink will be held on Thursday evening. The headliners are the British electronic duo Maribou State and singer Holly Walker – both playing in Russia for the first time. The artists recorded two tracks for their debut album in 2015 with Holly Walker, so it's not by chance the two acts will share the stage. Kirill Ivanov from the Petersburg band SBPCh will play a DJ-set before the main attractions. The headliners set will be followed by a spectacular firework display. 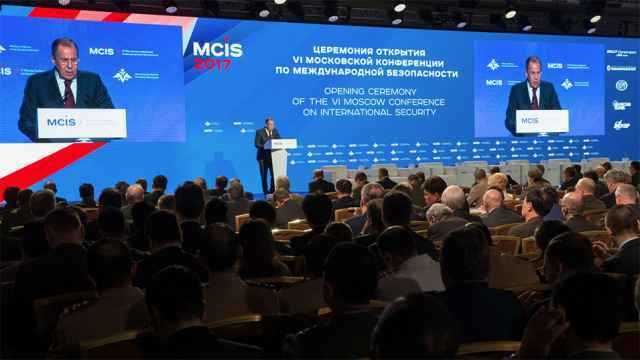 Other highlights will include a theatrical performance directed by Alice Kretova, an actress from Brusnikin Theater Studio, and Kirill Mosunov, choreographer of the opening and closing ceremonies of the Olympic and Paralympic Games in Sochi, and a DJ-marathon at the dance floor zone. On the opening night the skating rink will be open from 7 to 11 p.m. Entrance through pavilions 3, 4, 5 and 6. Gorky Park StereoRink will be open from 10 a.m. to midnight every day, with a technical break from 3 to 5 p.m. Entrance fees vary depending on weekday or weekend and morning or evening hours. For adults, it ranges from 300 to 600 rubles; for kids it varies from 150 to 300 rubles with non-skating accompanying adults paying 250 to 300 rubles. Skate rentals (almost all the skates are new this season): 200 rubles.